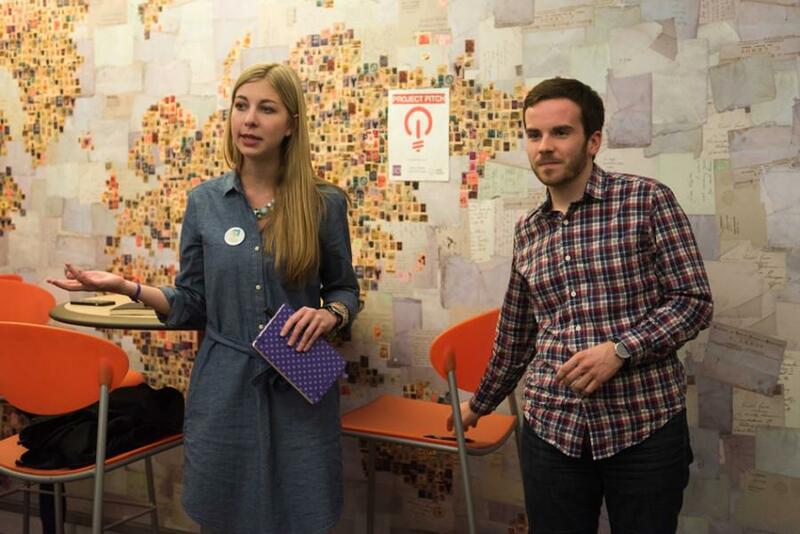 Haley Hinkle (left) and Chris Harlow talk about their platform Sunday night in Allison Hall. The two are running for Associated Student Government president and executive vice president. Haley Hinkle and Chris Harlow first worked together during their freshman year to create a Campus Loop Shuttle stop outside Elder Hall. The project was the first of many the two worked on together. This week, they are running for Associated Student Government president and executive vice president. Their campaign, the slogan for which is “Build Up,” emphasizes student wellness, inclusive community and student groups. Hinkle said her experience and her desire to help Northwestern students led her to run for president. Hinkle is ASG’s director of campus safety and transportation and Harlow, her running mate, is vice president for student life. Hinkle, the outgoing president of Deering Days and a member of Alpha Chi Omega sorority, has been an ASG member since Fall Quarter of her freshman year and oversaw ASG’s It’s On Us campaign. Harlow, a SESP junior, was technical coordinator for this year’s Dance Marathon and is the director of fundraising for Lending for Evanston and Northwestern Development. He said he’s running because he sees a lot of potential in ASG and wants to use it as an instrument for good. If elected, Hinkle and Harlow plan to reform the Responsible Action Protocol to guarantee students who call for help for another student suffering an alcohol overdose do not find themselves in trouble. The current protocol takes into account students’ conduct but does not guarantee amnesty. Harlow said this forces students to put too much trust in the administrative process, a shaky foundation for what could be a medical emergency. Their student wellness platform also includes dropping the number of credits to graduate from the Weinberg College of Arts and Sciences from 45 to 42 and pushing for a day off during Winter Quarter for students to focus on their well-being, something the University of Chicago does. Weinberg senior Amanda Meyer, co-president of NU Active Minds, is endorsing Hinkle and Harlow and said she appreciates the campaign listing student wellness among its areas of focus. Hinkle said the University, which is currently moving to implement massive changes in on-campus housing over the next decade, should move to expand gender-open housing to residential colleges and North Campus residences, another aspect of her platform. The two are also advocating for the creation of a U.S.-based Social Inequalities and Diversities Requirement in all six schools and giving low-income students subsidies for class materials such as laptops and books. They also want to make the Student Organization Finance Office easier to deal with for student groups. The current system, Hinkle said, is far from perfect and creates unnecessary headaches for groups. Hinkle and Harlow’s platform also demands the University be more transparent in its budget-planning and investment processes. Hinkle and Harlow are running against Weinberg junior Noah Star and McCormick junior Christina Kim. The first debate between the two sets of candidates, which is sponsored by Coalition of Colors, will be held 6 p.m. Monday in Harris Hall. A second debate will be held 8 p.m. on Tuesday in Fisk Hall. Voting opens Thursday at 5 p.m and ends Friday at 5 p.m.